When I first saw the Marvel vs Capcom series I immediately thought that it would be cool if there was a DC vs Capcom game but it never happened commercially. But with mugen we don't have to wait for DC and Capcom to come to terms. 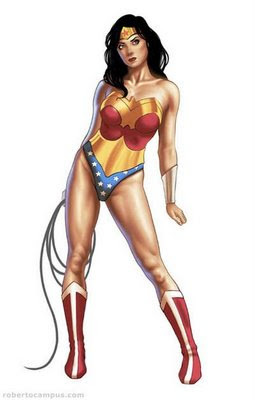 In my opionion if Wonder Woman and Chun Li ever really did fight, Wonder Woman would win.Chun Li is very formidible but she is not as power as the Princess of the Amazons. I mean Wonder Woman would be able to block her fireballs, and most likely counter everyone of Chun Li's abilities and moves. I decided to pit them against each other in MUGEN. Speaking of DC vs. Capcom. It was actually planned, but then cancelled for some strange reason. Bummer!